One of five known paintings from Washington’s sitting with Wright at the General’s headquarters at Rocky Hill, New Jersey in the autumn of 1783. 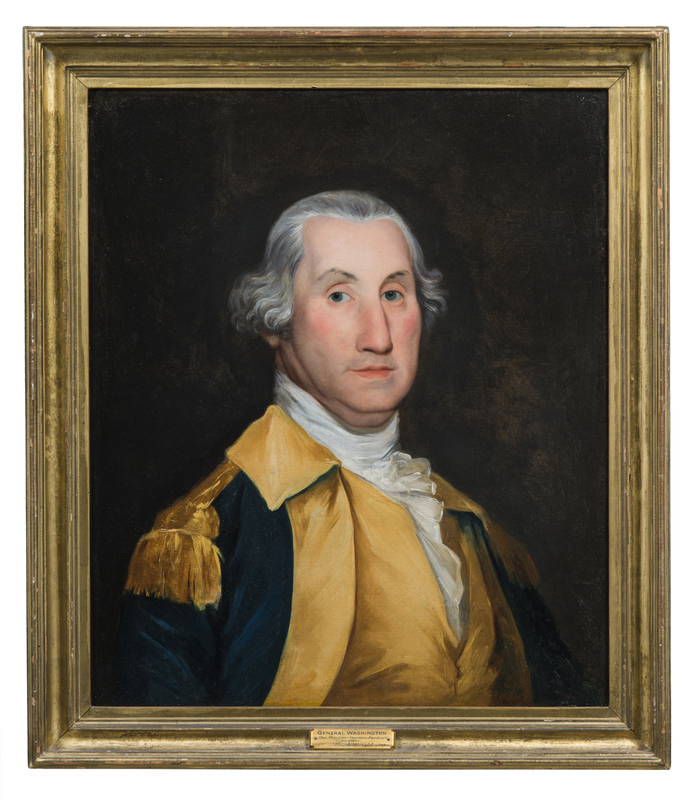 Bust length portrait of George Washington, shown nearly full face, in military uniform, on vertically oriented rectangular canvas. Washington’s body is turned to proper left and his head slightly to proper right, so that he looks directly at viewer. His eyes are blue; his lips are held in a straight horizontal line; his hair is silvery gray, worn tight to his head but projecting out over his ears. He wears Continental Army uniform consisting of dark blue coat with buff facings and collar, epaulets, buff waistcoat, and white shirt with ruffled stock. The coat and waistcoat display no buttons or buttonholes and the epaulets are sketchily painted. The background is a slightly mottled dark brown, with a darker halo around Washington’s head, and no details of landscape or furnishings. Frame: Gilt wood frame with deep cove profile.